Bailey Ruth Raeburn is back, racing against the Heavenly clock in an all-new mystery from the New York Times bestselling author of Ghost Times Two. Bailey Ruth finds herself comforting a distraught sister when she’s sent to Adelaide, Oklahoma, on her latest mission. Susan Gilbert receives a $100,000 ransom demand for her younger sibling. When the caller wants Susan to pay a visit to her wealthy boss and take the cash from his safe, Bailey Ruth follows Susan to the home. But she finds herself in a quandary, knowing that robbery is hardly a Heavenly pursuit. While Susan waits to hear back from the kidnappers, Bailey Ruth attempts to piece together how the criminals targeted Susan and how they know about her boss’s money. At a luncheon the previous week, Susan’s boss asked her to open the safe so all the attendees knew it was filled with cash. Could one of the rich man’s closest confidants be behind the abduction? 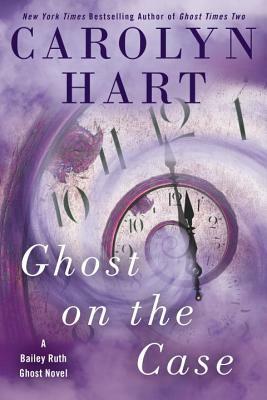 An accomplished master of mystery, Carolyn Hart is the New York Times bestselling author of sixty novels of mystery and suspense including the Bailey Ruth Ghost Novels and the Death on Demand Mysteries. Her books have won multiple Agatha, Anthony, and Macavity awards. She has also been honored with the Amelia Award for significant contributions to the traditional mystery from Malice Domestic and was named a Grand Master by the Mystery Writers of America. One of the founders of Sisters in Crime, Hart enjoys mysteries, walking in the park, and cats.